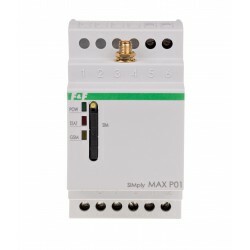 SIMply MAX P02 is a GSM relay which allows to remotely open automatic gates, garage doors, barriers using a mobile phone. It can be used for objects with protected access and a large number of users in order to eliminate cost of remote controls for every user. Relay can works with any GSM 900/1800 mobile operator (no SIMLOCK). In order to operate properly a valid SIM card has to be installed. 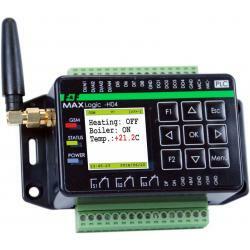 Controller has two output relays used to generate external signals for gate openers or electric door bolts. 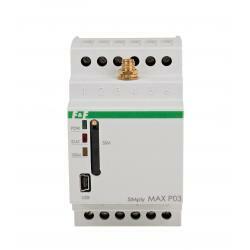 Both of relays are working parallel but different signal durations can be set. Thanks to the use of CLIP service all of commands are performed with no additional costs. The user dials to the controller number and waits until the controller rejects his connection. Relay verifies incoming phone number and decide to execute or ignore command. Additional external switches can be connected to device in order to control relays manually. In automatic mode, the relay output is activated again after a certain time in order to close the gate.